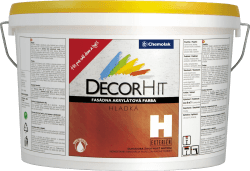 is an acrylic waterborne paint designed for coating of new walls and renewal of old facades in exterior. It creates a smooth matt surface resistant to water, weather conditions and UV radiation. It has very good adhesion to alkaline surfaces. The paint is tintable by Decormix system.